Up for sale is a stunning Martin Biron card. Don't let this amazing piece of hockey's history pass you by. Just imagine how great it would look in your personal collection. Brag to your friends, amaze your neighbors, and confuse perfect strangers with this astounding hockey card. 2006/07, MARTIN BIRON FLEER ULTRA UNIFORMITY AUTHENTIC AUTOGRAPHED JERSEY CARD UA-MB, 06/35. GET THIS GREAT SUPER STARS AUTOGRAPHED JERSEY CARD FOR YOUR COLLECTION. GET THIS CARD WHILE YOU CAN FIND IT AT THIS PRICE. 2010-11 / 10/11 Panini All Goalies Base Cards #1 -100 Goalies, U Pick! Here's a lot of Qty 9 - Martin Biron Rookie Cards. The lot consists of the following Rookie Cards This lot will make a wonderful addition to your Martin Biron collection! Qty 2 - 1996/97 Pinnacle Silver Foil Rookie Cards # 224. Martin Biron. "Trilogy Scripts ". 2006-07 Upper Deck Trilogy NHL Hockey. Autograph Card #TS-MB. Manitoba (MB):-------------------------------5.00%. Province -----------------------------------------Rate . 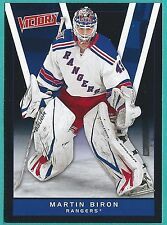 This item is a 2010-11 Upper Deck Victory BLACK PARALLEL Card #292 of Martin Biron. Here is a chance to own a terrific card at a great price. The Upper Deck Victory rookies are the first cards to be released each year. (2) 2003-04 ITG USED SIGNATURE SERIES MARTIN BIRON AUTO LOT GOLD /70 & /170 BUFFALO SABRES. THIS IS CARD #SA1 IN NM/MT OR BETTER. Martin played for the Buffalo Sabres. The card is numbered # EE-MB in the set. The jersey was worn in a official NHL practice and authenticated by Upper Deck. Then I can send a combined invoice. Condition:The card is in near-mint to mint condition. This is for one 2001-02 Martin Biron Sp Authentic Limited Future Great card. Card is #126 and has a serial # of 98/150. Martin Biron. The card is VERY nice. Card is #SOTT-MB in the set. International Orders. 2-Wait for an invoice. 1-Buy your item(s). Card is in a great condition. 2-Wait for an invoice. 1-Buy your item(s). 2006-07 Upper Deck MVP Hockey - Card 1-100 - YOU CHOOSE! 2007-08 Upper Deck VICTORY (1-124) - YOU CHOOSE! !